One American official says flatly that the EU is “winning” the regulatory race, adding: “And there is a sense that that is their precise intent.” He cites a speech by the trade commissioner, Peter Mandelson, claiming that the export of “our rules and standards around the world” was one source of European power. Noting that EU regulations are often written with the help of European incumbents, the official also claims that precaution can cloak “plain old-fashioned protectionism in disguise”. While the prime example in the Economist's article is a fine imposed on Microsoft for bullying its competitors, the fact that EU regulations are copied in the rest of the world holds true in many sectors of the economy. In the area of nutrition and healthcare, EU legislative activity has led to several new pieces of legislation that are - seen in their context - potentially disastrous for public health. The directives and regulations discussed in the linked document prepared by the Alliance for Natural Health diminish individual choice in health and prevention, while preserving the profitability of big industry and indeed slanting the 'playing field' in favor of the largest competitors. Codex Alimentarius, the United Nation's international food standard-setting body, has also been discussing food supplements, one of the subjects of the recent EU health legislation. The Codex guidelines, adopted at the Codex Commission's plenary session in July 2005 here in Rome, are little more than a copy of the European Directive adopted some years before. This seems to confirm the view expressed in the Economist's article, according to which the EU is "winning the regulatory race". The FDA would also like to harmonize our dietary supplement laws with the evolving international standards set by Codex, thus branding therapeutic nutrition as dangerous and risky and needing to be sold by Big Pharma or removed from the market altogether (if it competes with a blockbuster category of drugs). Codex is planning to use the same proteomics and biomarker technology that will be used by the FDA’s Critical Path Initiative to remove therapeutic dietary supplements from the international market and force their policies on America, thereby superseding the sovereignty of American law on threat of trade sanctions. The FDA fully supports draconian Codex guidelines to regulate dietary supplements and is working with the Germans to concoct technology to brand nutrients as drugs. Will Americans be able to maintain their nutritional freedoms in the face of pressure coming from both, international and domestic agencies? It appears that the problem may no longer be only American - there is an international trend of using "precaution" to brand nutrients as more dangerous than the pharmaceutical drugs that are killing hundreds of thousands every year. To counter the trend, we may have to look at its origins: a conservative view of nutrition rooted in certain European nations that never had a culture of nutrient-mediated prevention and healing, coupled with a view that the only remedies for good health are pharmaceutical drugs. Research and education will be essential to meet the challenge. Research to find and better define the effects of nutrients in prevention and healing, education to bring the conservative Europeans up to speed on how useful nutrients can be in prevention and maintenance of good health. With food supplements, we have an extremely cost effective and very safe tool to better public health. Why not use it to its full extent? As a friend recently said, Europe has really no need for all these complicated regulations. The Community has a principle - the free movement of goods and services - which would be quite sufficient on its own to ensure a working internal market. That means people could determine whether to use supplements to stock up on nutrients and to what extent they want to do that. The Germans and the French could buy their supplements in England or the Netherlands, if they weren't locally available. But apparently some governments believe they have to control every last aspect of our lives, and the EU bureaucracy seems to agree. A VICTORY for consumers and the free market. That was how the European Commission presented this week's ruling by European judges in favour of its multi-million euro fine on Microsoft for bullying competitors. American observers had qualms. Would a French company have been pursued with such vigour? Explain again why a squabble among American high-technology firms ends up being decided in Brussels and Luxembourg (where Euro-judges sit)? One congressman muttered about sneaky protectionism and "zealous European Commission regulators". It certainly seemed zealous of the competition commissioner, Neelie Kroes, to say that a "significant drop" in the software giant's market share was "what we'd like to see". More broadly, the ruling confirms that Brussels is becoming the world's regulatory capital. The European Union's drive to set standards has many causes-and a protectionist impulse within some governments (eg, France's) may be one. But though the EU is a big market, with almost half a billion consumers, neither size, nor zeal, nor sneaky protectionism explains why it is usurping America's role as a source of global standards. A better answer lies in transatlantic philosophical differences. The American model turns on cost-benefit analysis, with regulators weighing the effects of new rules on jobs and growth, as well as testing the significance of any risks. Companies enjoy a presumption of innocence for their products: should this prove mistaken, punishment is provided by the market (and a barrage of lawsuits). The European model rests more on the "precautionary principle", which underpins most environmental and health directives. This calls for pre-emptive action if scientists spot a credible hazard, even before the level of risk can be measured. Such a principle sparks many transatlantic disputes: over genetically modified organisms or climate change, for example. In Europe corporate innocence is not assumed. Indeed, a vast slab of EU laws evaluating the safety of tens of thousands of chemicals, known as REACH, reverses the burden of proof, asking industry to demonstrate that substances are harmless. Some Eurocrats suggest that the philosophical gap reflects the American constitutional tradition that everything is allowed unless it is forbidden, against the Napoleonic tradition codifying what the state allows and banning everything else. Yet the more proscriptive European vision may better suit consumer and industry demands for certainty. If you manufacture globally, it is simpler to be bound by the toughest regulatory system in your supply chain. Self-regulation is also a harder sell when it comes to global trade, which involves trusting a long line of unknown participants from far-flung places (talk to parents who buy Chinese-made toys). A gripping new book by an American, Mark Schapiro, captures the change. When he began his research, he found firms resisting the notion that the American market would follow EU standards for items like cosmetics, insisting that their American products were already safe. But as the book neared completion, firm after firm gave in and began applying EU standards worldwide, as third countries copied European rules on things like suspected carcinogens in lipstick. Even China is leaning to the European approach, one Procter & Gamble executive tells Mr Schapiro, adding wistfully: "And that's a pretty big country." The book records similar American reactions to the spread of EU directives insisting that cars must be recycled, or banning toxins such as lead and mercury from electrical gadgets. Obey EU rules or watch your markets "evaporating", a computer industry lobbyist tells Mr Schapiro. "We've been hit by a tsunami," says a big wheel from General Motors. American multinationals that spend money adjusting to European rules may lose their taste for lighter domestic regulations that may serve only to offer a competitive advantage to rivals that do not export. Mr Schapiro is a campaigner for tougher regulation of American business. Yet you do not have to share his taste for banning chemicals to agree with his prediction that American industry will want stricter standards to create a level playing-field at home. One American official says flatly that the EU is "winning" the regulatory race, adding: "And there is a sense that that is their precise intent." He cites a speech by the trade commissioner, Peter Mandelson, claiming that the export of "our rules and standards around the world" was one source of European power. Noting that EU regulations are often written with the help of European incumbents, the official also claims that precaution can cloak "plain old-fashioned protectionism in disguise". Europe had no idea the rest of the world was going to copy its standards, retorts a Eurocrat sweetly. "It's a very pleasant side-effect, but we set out to create the legislation we thought that Europe needed." At all events, America's strategy has changed. Frontal attempts to block new EU regulations are giving way to efforts to persuade Brussels to adopt a more American approach to cost-benefit analysis. That would placate students of rigour, who accuse some European governments of ignoring scientific data and pandering to consumer panic (as shown by European campaigns against "Frankenstein foods"). But rigour can quickly look like rigidity when it involves resisting competition. There is a genuine competition to set global regulatory standards, as Europe and America have discovered. There are also rising protectionist pressures. Perhaps zealous EU regulators may be what jumpy consumers need if they are to keep faith with free trade and globalisation. Viewed in such a light, even Microsoft's champions might hope that this week's verdict will help global competition in future. (April 2007) - The European Union and the United States recently announced the signing of a Framework for Advancing Transatlantic Economic Integration at a summit in Washington. Describing the agreement as "a statement of the importance of trade", President Bush, speaking at the post-summit press conference, claimed that it was "a commitment to eliminating barriers to trade" and "a recognition that the closer that the United States and the EU become, the better off our people become." Is Codex not just the new face of I.G Farben? The nazi chemical company which is now the leading pharmaceutical companies.??? I.G. Farben was a conglomerate of the major chemical/pharmaceutical companies in WW II Germany. The individual companies survived and are still around, some of them fused with other similar entities in the name of corporate efficiency. The founding of Codex Alimentarius indeed goes back to a time (1963) when Fritz Ter Meer, former I.G. Farben executive and then head of Bayer, had strong political influence in Germany, which started the Codex initiative. Germany has since been host to the influential Nutrition Committee\'s meetings, and we know what was the outcome of their discussions on vitamin supplements. 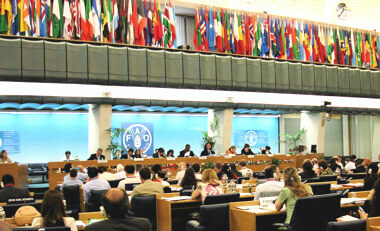 See Codex history here and supplement guidelines passed in the Nutrition Committee here. This monograph documents the rise in Europe of the so-called "precautionary principle�?? and its proponents' plans to export this regulatory approach to U.S. and our trading partners. This principle eschews science-based evaluation of the benefits and costs of regulation in favor of environmental, health, and safety rules which seek to eliminate every possible risk from economic conduct. Europe seeks to reform U.S. law and business practices by establishing its Precautionary Principle as U.S. federal, state & local law. If successful, Europe will undermine the U.S. national economy and America's comparative advantage in international trade. This article documents precisely how Europe seeks to accomplish its objective, how it significantly threatens the American legal and free enterprise systems, and why Americans must prevent the Precautionary principle from ever becoming U.S. law. In the current issue of the Global Trade and Customs Journal, international trade and regulatory lawyer Lawrence Kogan details how the European Union and its member states previously enlisted private European environmental standards bodies to promote official government sustainable forest management policies that likely violated the World Trade Organization rights of developing countries and their industries. In addition, the article describes how these same EU governments are behind the ongoing efforts of other European pressure groups to promote, via United Nations agencies and international standardization organizations, the adoption by global industry supply chains of overly strict corporate social responsibility standards. According to Mr. Kogan, "It is no secret that the EU aspires to 'usurp America's role as a source of global standards,' and to become 'the world's regulatory capital' and 'standard-bearer.'" Therefore, it is natural that they would endeavor to employ whatever nontransparent means are available to push their regulatory control agenda forward." As EU trade commissioner Peter Mandelson claimed in a prior speech, 'exporting our rules and standards around the world is one source [and expression] of European power.'" The philosophical and psychological bases underpinning European Union's grab for global regulatory control are rooted in Europe's Precautionary Principle. The moral, social and environmental cognoscenti of the new communitarian movement for global governance hold the precautionary principle as a doctrinal article of faith. The philosophy advocates a 'Better Safe than Sorry' ethos to modern day living. One public relations expert remarked several years ago that Europe's unilateral efforts to establish the precautionary principle as an absolute global legal standard reflects a deeper institutional and cultural aversion to risk not found in the United States. Sharp demographic differences between the two powers appear to support this fact; "European electorates are aging must faster than America's, making Europeans more risk averse.�?? As a result, geriatric Europeans reflexively fear the myriad uncertainties surrounding new technologies and industrial processes, especially unfathomable risks that populate the distant future, and potentially affect their health and environment, even though no actual proof of imminent risk of harm is present. Because of this fear, European elites and like-minded American Europhiles argue that such advances should be shunned, even if it means grinding global societal progress to a halt. In essence, some sort of blurring or unnatural fusion may have occurred between the multitude of values and phobias long submerged within Europe's collective psyche and the extreme, almost religious utopian ideologies of post-communist European social and environmental groups. This convolution of European fears, ideals and hypothetical realities has manifested itself in the form of the precautionary principle. If its underpinnings indeed manifest a disease (i.e., Precautionus Principilitis), its symptoms and diagnosis would be quite telling: a disorder induced by stress and repressed feelings of inferiority and desperation, marked by extreme luddism, incoherent babbling, disorientation, and a shared form of delusion. may have been an intellectually satisfying exercise for the person who thought this up, but it is far from grounded within reality. As a citizen of one of the countries that are part of this European community, I can only agree with you that excessive precaution is not the way to go. But I also would like cite Anthony Burgess who once famously said: "the doctor is sick".